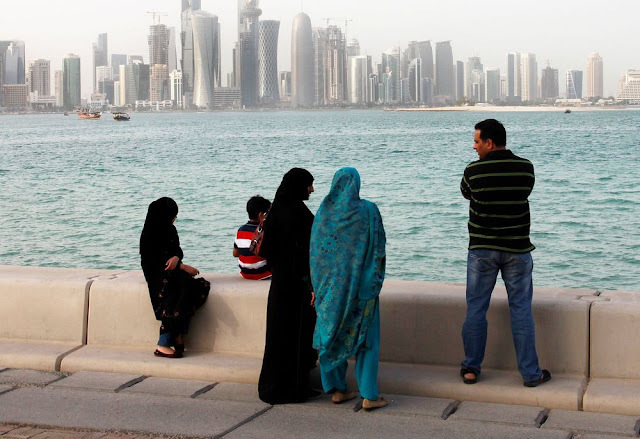 (Bloomberg)- Qatar, facing a Saudi-led boycott, approved landmark legislation with the potential to ultimately transform Gulf societies by granting permanent residency to some of the foreigners who dominate its population. The elevated status would be the first in the Gulf region, where the privileges of nationals have been zealously guarded and expatriates’ access to public services and property rights are sharply curtailed. Under the new law, permanent residents will be treated more like Qatari nationals and will benefit from elements of the state’s generous welfare system, including education and health-care services, the official Qatar News Agency reported late Wednesday. They will also be given priority, after locals, for military and civilian public jobs and would be allowed to own property and run certain commercial activities without a local partner, QNA reported. Those eligible for the card include children of Qatari women married to foreigners, people with special talents “needed by the state,” and others who have extended notable services to the country, it said. Citizenship, however, will remain off-limits to foreigners. The action “is symbolically significant, and will make some expatriates in Qatar feel like they now have a more substantial stake in the future of the country,” which could give them an incentive to stay and make additional investments in the country, said Allison Wood, a Middle East and North Africa analyst with the Control Risks strategy firm in Dubai. The Interior Ministry will set up a department to consider applications, QNA said. The legislation was approved after Qatar’s ruler, Sheikh Tamim bin Hamad Al Thani, instructed officials in a July 22 speech to expedite measures to lure investments and reduce the economy’s reliance on energy in the wake of the boycott. He said opening up the economy was no longer a “luxury” but an obligation. The six Gulf nations that make up the Gulf Cooperation Council are under pressure to diversity their economies amid low oil prices, and they rely on expatriates who began pouring into the region during the energy boom of the 1970s to run their economies. Except for Saudi Arabia and Oman, foreign workers and their families outnumber local populations in the GCC, and in Qatar, they account for 88 percent of residents, according to the CIA World Factbook. With few exceptions, the majority of foreigners in Oman, Qatar, Saudi Arabia, Bahrain, the United Arab Emirates and Kuwait need to be sponsored by locals to live and do business. Citizens, on the other hand, receive state support widely seen as a tradeoff for political loyalty. Qatar, which has adopted policies that diverge from GCC consensus and sheltered groups banned in some Gulf countries, is again taking a “unique approach” that likely won’t be endorsed by its two neighbors leading the boycott -- Saudi Arabia and the U.A.E., said Ayed Al-Manna, a Kuwaiti political analyst and newspaper columnist. Qatar came under intense international criticism over its treatment of foreigner laborers after winning the right to host soccer’s 2022 World Cup. The government has since pledged to improve the workers’ living and working conditions. The idea of allowing foreigners to reside in Gulf countries for longer periods has also been discussed in other countries as they seek to to bolster non-oil revenue after the plunge in crude prices. Last year, Saudi Arabia’s Crown Prince Mohammed bin Salman told Bloomberg in an interview that the government was weighing a green card-type program for foreign workers. The U.A.E. said in February it was working on a new visa system designed to attract top foreign talents in fields such as medicine, science and research to the country. Wood said that over time, other GCC states may adopt similar programs as they look to diversify from oil, but will preserve the rights and privileges given to citizens for some time to come. “The ruling families of the Gulf will want to preserve the existing social and political contract in their states -- that these families are given the power to rule in return for caring for citizens of these states,” she said. Approving these laws doesn’t mean that implementation will swiftly follow, said Anthony Cordesman, an analyst with the Washington-based Center for Strategic and International Studies.